Last week, around 22 innovators met at the Southeast Asia Open Data Innovation week organized by Open Data Lab Jakarta of the World Wide Web Foundation. This was definitely not your typical open data event. And by typical I’m talking about lightning talks, multiple panels (even manels! ), hackathons, and other variations. Granted, activities have various objectives and are built for specific people in mind but what resonated with me was the question this event sought to answer. When the dust has settled and the cool swag has been distributed, we are faced with a consistent pain point — is there anything else we can do to help practitioners, policymakers, and researchers do their open data work better and with more impact? And that’s where this innovative event comes in. Apart from the novelty of bringing people with diverse knowledge and expertise to build practical tools (think worksheet), the critical challenge was to ground our outputs in context and not forget why we’re designing it. We likewise created and agreed on criteria for assessing what makes a good tool: a clear value proposition, resource efficient, accessible and usable, sustainability, and ‘forkability’ (meaning adaptable… we’ve no idea if this is a real word!). This was the title of an exhibit of prints on silk scarves that I saw a couple of years back. For some reason, that was the line that popped in my head at the end of the workshop. There are multiple ways to design, implement, and take stock of various open data initiatives. I’ve seen that some open data practitioners — because of the autopilot mode of being in continuous implementation — often forget to take a few steps back, be critical of ‘how’ things were done, and assess the appropriateness of the tools used. If we are to make open data relevant in people’s lives and address social inequities, the challenge begins with questions: What tools have I been using? What intermediate outcomes have these led to? What was the context when I used it? What factors helped or hindered when I used these tools? 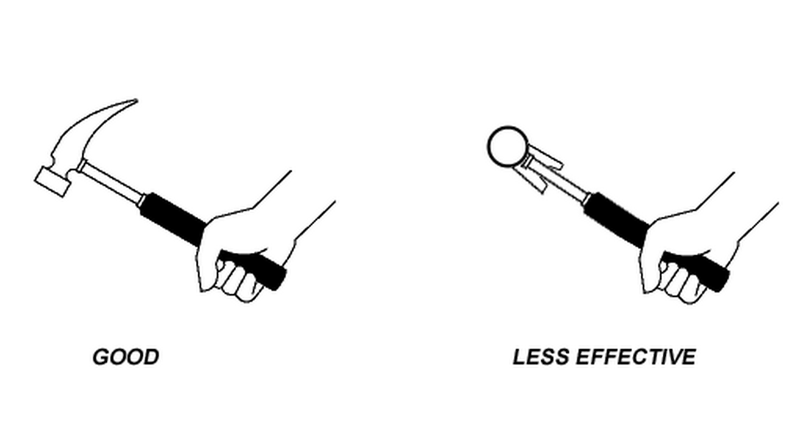 If appropriate, what tool am I missing so I can design/implement high-impact open data projects? These are sample questions and I’m sure there’s more. The point? It’s important to have a heightened awareness of the tools/methods/approaches you bring to an open data initiative. Know what it’s for, what the limits are, and what your context calls for. I’d like to think that if you know your ‘weapons’, you can pick which battle to wage and when to call for help. At first, some of us struggled with our respective definitions of what an open data tool is. I suppose it didn’t help that we’ve been so used to various stories of “There’s an app for solving x!” or “There’s a ___-a-thon addressing y!” We had to disassociate the term with something that attempts to solve a problem ala if-then scenario. So when the discussion shifted to examples of what is meant by a tool (more samples), that sparked the energy burst to start working on it in time for our presentations so that we could all get feedback based on the criteria we agreed on. If you think about the term ‘the devil is in the details’, well… we were swimming in that space before we had our respective Aha moments for our tools. 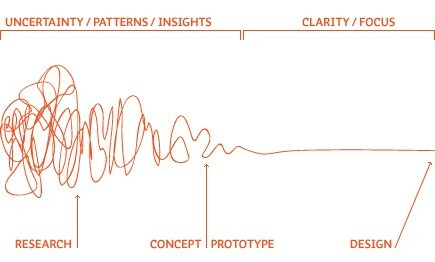 The process reminded me of the Design Squiggle, specifically the Uncertainty/Patterns/Insights mode. Whenever I think about an innovation lab or a start-up, I have visual images of colorful bean bags, open office designs, standing desks, and IKEA. In my mind these were attempts to provide a series of ‘anomalies’ that sought to trigger a thought: this new environment would ask me to practice new behaviors. Having the chance to co-create and learn with the 22 innovators and Jakarta Lab members was definitely an anomaly in my schedule. I’m grateful for that opportunity because the Jakarta Lab provided us with thinking space — not only a physical space that allowed us to bob balloons when we were mulling over a question — but a chance to generate ideas, dig deep into our unique experiences, get challenged by difficult questions from our peers, and not be afraid to show a quickly created storyboard made of clay, legos, and cardboard cutouts. Then get hit by more questions and still survive the public presentations. From that safe space of learning, we get to go home to test what we’ve created and, in the process, generate more knowledge of what works, what missed the mark, and recalibrate. I hope the Lab continues to play this unique role for open data in Southeast Asia. I hope this was just the beginning to have a networked community that aims to be more involved in open data innovation. Creating the space where innovators have a chance for “in-person creative clashes” is crucial if we are to attempt doing open data work differently and with better impact. This event was a great first attempt and I wonder if the questions below are helpful. I’ve no idea if this has been done in specific sectors! How can this type of workshop affect those involved with designing, implementing, and evaluating open data and SDGs? I wonder what the effect would be to have a workshop that has significantly more government innovators mixed with a few practitioners and subject matter experts?